Three miles west of town is Dionis, a small area consisting mainly of sandy roads and quiet neighborhoods. Dionis Beach is located on the western side of the north shore with a backdrop of steep, picturesque bluffs. Its calm waters are safe for children, making it a popular beach for families. Eel Point is comprised of more than 100 acres of conservation land that abounds in wild roses, bayberries, goldenrod, wild grapes, and other vegetation. 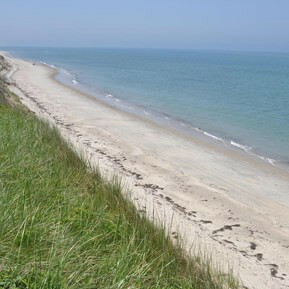 The remote Eel Point Beach is on the most western end of the north shore and accessible only by foot or four-wheel drive. Because the beach is subject to tidal flooding, it's possible to get stranded. The beach abounds with sea grass, which eels love, hence the name of the beach. If you go to Eel Point, be sure to bring a bucket. 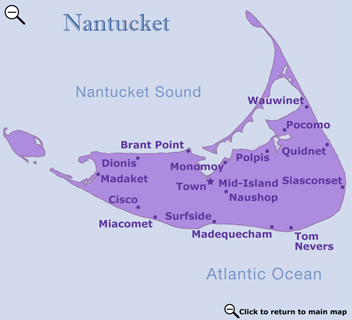 It is the best beach on Nantucket for collecting seashells, many that you won't find on any of the other beaches. There are no lifeguards or restrooms on this beach, so you are on your own. Eel Point is also a great place to watch the sunsets, second only to Madaket. It also attracts a large variety of birds.